Sringeri (ಶೃಂಗೇರಿ ) also called Sri Kshetra Shringeri is a hill town and Taluk headquarters located in Chikkamagaluru district in the state of Karnataka, It is the site of the first maṭha (Sringeri Sharada Peetham) established by Adi Shankara, Hindu theologian and exponent of the Advaita Vedanta philosophy, in the 8th century CE It is located on the banks of the river Tungā . The name Sringeri is derived from Rishyashringa-giri, a nearby hill that is believed to have contained the heritage of Rishi Vibhandaka and his son Rishyashringa. Rishyashringa appears in an episode in the Bala-Kanda of the Ramayana where a story, narrated by Vasishtha, relates how he brought rains to the drought-stricken kingdom of Romapada. According to legend, Adi Shankaracharya is said to have selected the site as the place to stay and teach his disciples, because when he was walking by the Tunga river, he saw a cobra with a raised hood, providing shelter from the hot sun, to a frog undergoing labour. Impressed with the place where natural enemies had gone beyond their instincts, he stayed here for twelve years. Adi Shankaracharya also established mathas in the northern (at Jyotirmath, near Badrinath), eastern (at Puri) and western (at Dwaraka) quarters of India. As of the 2011 India census, Sringeri had a population of 36,539. Males constitute 49% of the population and females 51%. Sringeri has an average literacy rate of 86.12%, higher than the national average of 74.04%: male literacy is 90.45%, and female literacy is 81.91%. In Sringeri, 8.5% of the population is under 6 years of age. Sringeri is home to a number of historic temples. Of these, Sri Sharadamba temple and Sri Vidyashankara temple are very prominent.Other historic temples nearby are Hornadu, Kollur. Construction of the 127 feet tall Rajagopuram entrance was completed in June 2014. The grand Kumbhabhishekam (inauguration) was performed by Jagadguru Shankaracharya Sri Sri Bharati Tirtha Mahaswamiji on Jaya Samvatsariya Jyeshtha Shuddha Dashami falling on June 08 2014. The Sharada temple, dedicated to the Goddess of learning and wisdom, has grown from a simple shrine dating to the time of Adi Shankaracharya. In the fourteenth century, Vidyaranya is said to have replaced the old sandalwood image with a stone and gold image. The temple structure itself continued to be made of wood till the early 20th century. After an unexpected fire that damaged the structure, the current structure was built in the traditional south Indian style of temple architecture. The Vidyashankara temple was built in commemoration of the pontiff Vidyashankara, around 1357-58 C.E.. It was built by Vidyaranya, patron-saint of Harihara and Bukka, the brothers who founded the Vijayanagara empire. The niches in the temple have a number of sculptures from Hindu mythology. Inscriptions in the temple record contributions made by several Vijayanagara emperors but the temple was probably built on an earlier Hoysala site as it combines Hoysala and Vijayanagara architectural features. The temple architecture is also an exhibition of the astronomical expertise of medieval south Indian temple builders. The main temple hall features 12 pillars designated for the 12 signs of the zodiac. Windows and doors along the temple walls are arranged such that equinoxes sunrise views reach the deity. The northern and southern gates enable the sunrise view from the hall during solstices. The Vidyashankara Temple was built in the year 1338 A.D. It is a unique monument built entirely of stone combining both Hoysala (Chalukya) and Dravidian architectural styles. The structure stands on a high plinth and commands an extensive view from the hills and their slopes all round. It is more or less a rectangle with apisidal east-west ends. On the western side is the Garbhagriha, with Vidya Ganapati on one side and Durga on the other side of the entrance. On the other three sides of the Garbhagriha are shrines to Brahma, Vishnu and Maheshwara with their consorts. In the eastern half of the structure is a mantapa with twelve pillars, huge monoliths carrying large figures and carrying heavy projecting corbels on top. These twelve pillars are marked by the twelve signs of the zodiac in their regular order, and arranged in such a manner that the rays of the sun fall on each of them in the order of the twelve solar months. On the floor is a large circle, marked with converging lines to indicate the direction of the shadows. The central ceiling is an exquisite piece of workmanship with lotus and pecking parrots. The vimana over the Garbhagriha rises with shikhara, mahapadma and stupa. The rest of the roof is made up of sloping channelled slab. The basement is elaborately sculpted with animals, puranic stories, Shiva, Vishnu, Dashavatara, Kali, Shanmukha and so on. From the caves of the corners of the central hall chains of stone rings hang which is a common feature of the Vijayanagar period. To the student of Hindu iconography, this temple is a veritable store house of sculpture. The meditation of the Linga (Vidya Shankara Linga) in the sanctum and other Murtis will lead to Divine realization. Vidyatirtha Rathotsava is celebrated on a grand scale during kartika Shukla paksha. The festival spans for seven days from Tritiya to Navami. On the Saptami day His Holiness Jagadguru Bharathi Teertha Mahaswamiji performs special Puja. Also the Aradhana of Sri Vidya Shankara is performed on shasti, saptami and ashtami. This temple is under the care of the Archaeological Survey of India owing to its architectural marvel. Sri Parshwanath Basadi (Digambar Jain Temple) is situated in the heart of Sringeri Town. This basadi was built in the memory of Mari Setty whose origin goes to one Vijayanagara Shanthi Shetty of Nidugodu village near Belur. The date of construction comes to about 1150 A.D. The main temple is 50 feet long and 30 feet wide. Completely built of stone it has a slooped roof. The Basadi consists of Garbhagriha, Sukhanasi, Navaranga, Mukha Mandapa and Pradakshina Patha. In the Garbhagriha, there is the idol of Sri Parshwanatha Swamy presiding deity made of black stone. It is one foot high and on its base, the words Srimathparisanathaya Namaha are inscribed. Generally a single cobra holds its hood over the Lord’s head. But here, the speciality is that a pair of cobras intertwined hold their seven hoods like an umbrella. Hence this deity is known as Jodi Parshwanatha Swamy. In the sukhanasi the idol of Goddess Padmavati is kept. It is about nine inches in height and is made of black stone. Besides this there are also Jina images of marble, sphatika, black stone and the bronze images of 24 tirthankaras in the Gandhakuti, as well as idols of Brahma, Saraswathi, and Ganadharas. Sirimane falls is situated at a distance of 12 km from Sringeri. Visitors can visit the place by two wheelers and small vehicles like Car, Jeep and Suvs. No public transport is available to Sirimane falls. However limited number of buses from Sringeri town till Kigga are available. Kigga is located 5 km away from the falls. One can Hire vehicles from Sringeri to visit Sirimane falls. Hanumanagundi falls also known as Soothanabbi falls is located on the way to Horanadu Via Kudremukh. Distance between Sringeri and the waterfalls is 36 km. Waterfalls lies inside Kudremukh National forest which is famous for Shola Forests. Gangamoola the birthplace of Tunga, Bhadra and Netravati rivers also lies in this region. Sri Adi Shankara had constructed four temples on the four sides of the sringeri village. This is located at the centre of the Sringeri town. The Sringeri matha is known as Sringeri Sharada Peetha. It is one of the four Hindu Advaita maths established by Adi Shankaracharya. It is also referred to as Dakshinamnaya Sringeri Sharada peetam. Following the tradition initiated by Adi Shankaracharya, the maţha is in charge of the Yajur Veda (the Krishna (Black) Yajurveda is more prevalent in South India, over which the maţha has authority in the Smarta tradition).The head of the matha is called Jagadguru (teacher to the world) and also carries the Shankaracharya name as a title. The present Sringeri Shankaracharya Shri Bharati Tirtha Swamiji has nominated Jagadguru Vidhushekhara Bharathi Mahaswami as his successor. The twelve pillars in the Vidyashankara temple are popularly known as Rashi Stambhas (Zodiac Pillars). Symbols of the twelve divisions of the zodiac are engraved on these pillars. The temple is an architectural marvel. Among the many delicate carvings, lions that are engraved in biped positions on the pillars may be mentioned. There are stone balls inside the growling faces of the lions and they can be moved inside their mouths. It is said that the design of the pillars involved certain astronomical concepts. For example, the first rays of the rising sun fall on specific pillars with the zodiac symbol on the pillar corresponding to the position of the sun. Sringeri can also be reached from Mangalore which is at distance of 105 kilometers by road via Karkala. KSRTC operates AC and Non AC luxury buses from Bengaluru. Other travels like SRS and Sugama operate buses from Bengaluru. Sringeri is situated at a distance of 86 kilometres from Chikmagalur by road. 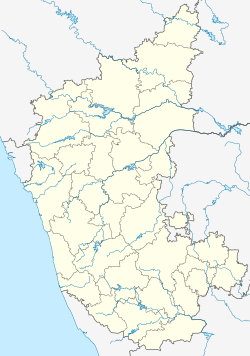 Chikkamagaluru is connected to Bengaluru and other cities through road and a rail line via Kadur. It is 95 km from Shimoga which is connected to Bengaluru through Bus and Rail routes. Private buses are operated from Sringeri to Shimoga with good frequency. Udupi is at distance of 80 km via Hebri and Agumbe. The nearest airport is Mangalore International Airport at Mangalore. Sringeri is a small village but the number of accommodation options available is really astounding. The town has guest houses run by the temple administration. Visit Sringeri Mutt web site for details. There are many private lodges also. Since Sringeri is situated in the Malnad region, the best time to visit is between October and March. ^ "The legend of Rishyasringa". Sringeri Sharada Peeta. Retrieved 7 November 2006. ^ "Census of India 2001: Data from the 2001 Census, including cities, villages and towns (Provisional)". Census Commission of India. Archived from the original on 16 June 2004. Retrieved 1 November 2008. ^ "Sri Sharadamba Temple". Sringeri Sharada Peeta. Retrieved 7 November 2006. ^ "Sri Vidyashankara Temple". Sringeri Sharada Peeta. Retrieved 7 November 2006. ^ "Zodiacal pillars of Sringeri" (PDF). Current Science. Indian Academy of Sciences. Archived from the original (PDF) on 7 October 2007. Retrieved 25 March 2006. ^ "Vidyashankara Temple". Indiantemples.com. Retrieved 7 November 2006. Wikimedia Commons has media related to shringeri.